Sam Mirpoorian and Brenton Oechsle, both graduates of the Media Arts and Science (MAS) undergraduate program in video and sound production at the IU School of Informatics and Computing at IUPUI, will help premiere the documentary film, Destination Park, at the Tribeca Film Festival beginning April 18 in New York City. Mirpoorian is editor and co-producer, while Oechsle is director of photography and co-producer. Mirpoorian, who graduated in 2017 and is on hiatus from the school’s MAS master’s program, and Oechsle, who graduated in 2013, met at a Heartland Film Festival event. Both became involved in the project via the Indianapolis film community and connections with the director, Andrew Cohn, who filmed Night School in Indianapolis in 2014. 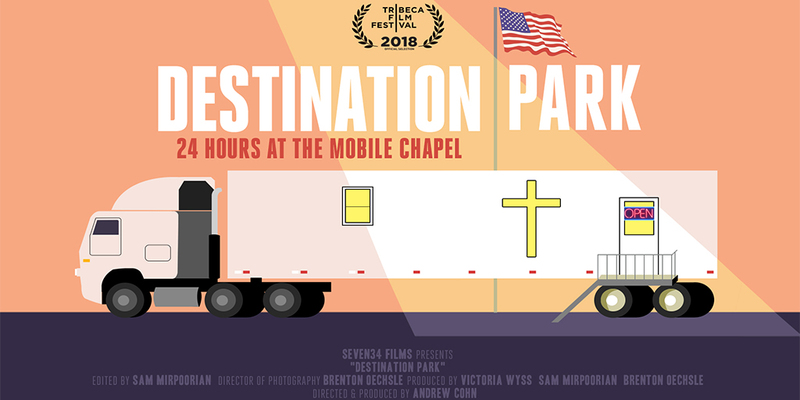 Destination Park is a short film about a group of truck drivers that confide their fears and anxieties to a chaplin at a truck stop confessional in Grand Rapids, Michigan. The film’s name is taken from the specific type of truck stop. A destination truck stop is where truckers wait—sometimes for an indeterminate amount of time—until they find out where they will be dispatched next. “In fall 2016, Andrew Cohn approached me about the concept of shooting a short documentary on mobile chapels,” says Oechsle. “We both felt that with the political climate since the election this would be a pertinent subject to focus on.” The majority of the trucking population are older, white, conservative males and Cohn and Oechsle felt that a deep dive into their way of life and psyches would serve a greater purpose, beyond the film. The Tribeca Film Festival is one of the most prominent in the world and attracts over 400,000 film enthusiasts. Created in response to the September 11 tragedies, it is considered to be on par with Cannes and Sundance. “To have this film world premiere is just a feeling like no other. I am blessed and fortunate to have played a role,” says Mirpoorian. Oechsle and Mirpoorian credit many of their professors, in particular C. Thomas Lewis, Zebulun Wood, and Rodney Smith, for their educational grounding in the profession. The MAS program gave them the freedom to explore creativity and to pursue whatever project they sought out. Mirpoorian adds that truly the best way to hone filmmaking skill sets is by just literally ‘doing’.